Oak trees are deciduous trees that have broad leaves. Most oaks shed their leaves every year. Oak tees live up to 200 or more years. There are records of oaks that are over 400 years old--the oldest is in Talbot County, Maryland, and is about 32 feet in circumference and about 105 feet tall. Oak trees need various nutrients to thrive, including magnesium for chlorophyll production, calcium for cell wall rigidity, phosphorus, nitrogen and sulfur for proteins, and potassium for regulatory functions. Additionally, the oak tree needs moisture, carbon dioxide and energy from the sun. A mature oak tree can easily draw 50-plus gallons of water every day from the soil through its root system. 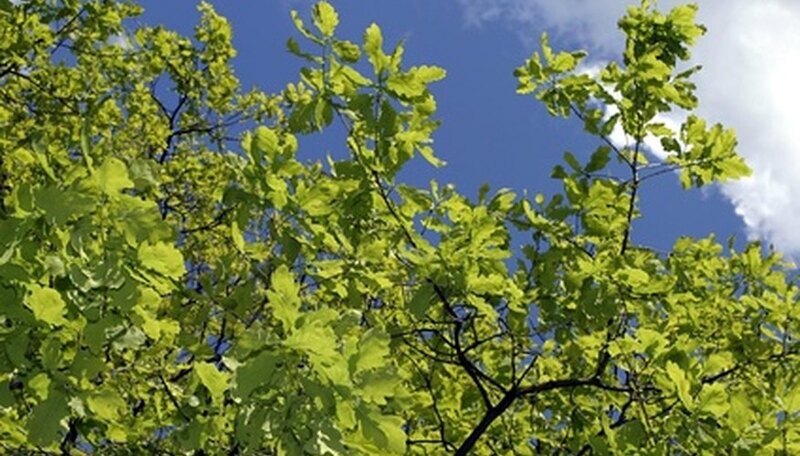 Without the proper amount of water (and nutrients), the oak tree leaves start turning yellow, acorn production is affected and the oak tree grows much slower. 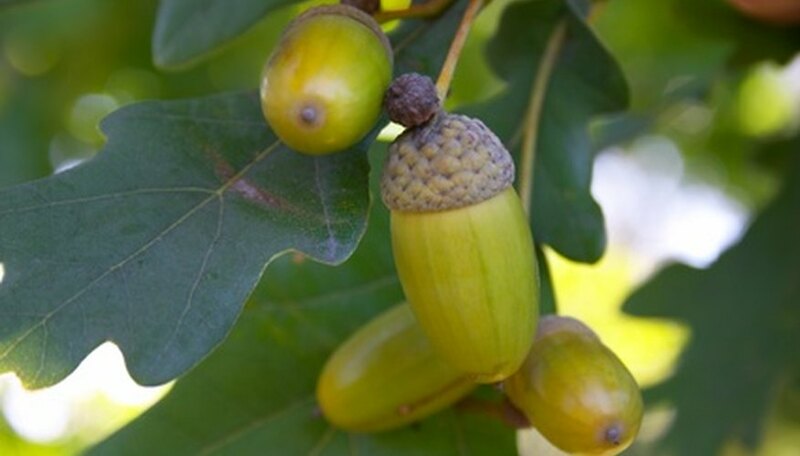 Oak trees do not produce acorns until they reach about 20 years old. Occasionally, an oak tree might not produce acorns until it is 50 or older. Acorns are produced once per year (in the fall). If there is a late spring frost, the flowers might be affected, producing a poor crop of acorns in the fall. There are several things that can destroy oak tree leaves, including fire caused by nature (lightning) or humans. 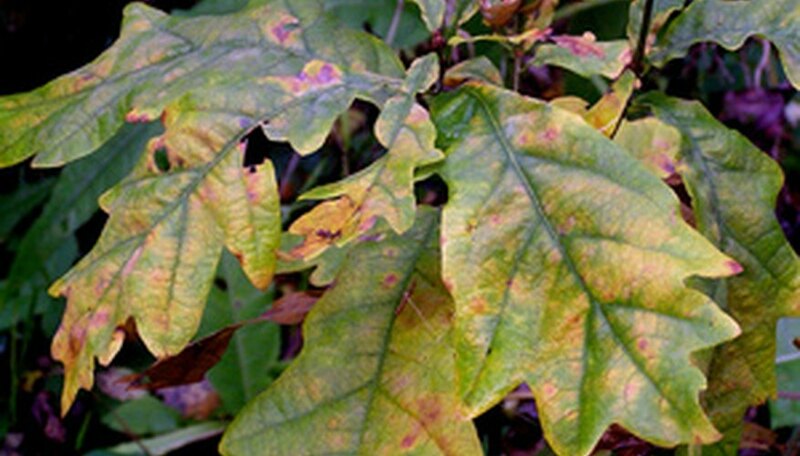 Bad weather, beetles and fungi also can kill oak trees through their leaves. One of the biggest pests of the acorn tree is the weevil. Weevils destroy the acorns by planting their seeds in the acorns during the late summer. These acorns will not grow to reproduce. At the same time, if there are not enough acorns, the weevils have no place to lay their eggs, and the weevil population suffers that year.